The other requirement is that you must have Taxes turned off. Note: if either of these requirements fails (e. g. you change gateways, or turn on taxes) any Buy Now buttons will automatically revert to Add To Cart buttons (including free purchases). If you're using one of the above payment gateways then Buy Now buttons will be available to you on product pages in the admin area. 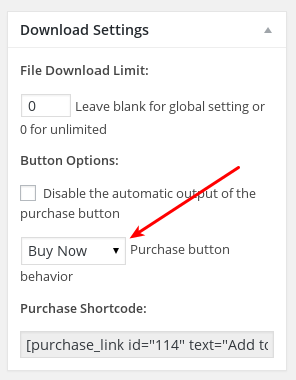 Go to Downloads → All Downloads and edit the Download that you'd like to have a Buy Now button. In the right column you'll find a meta box called Download Settings. In that meta box is a drop down offering the option of "Add To Cart" or "Buy Now". Choose Buy Now and save the product. 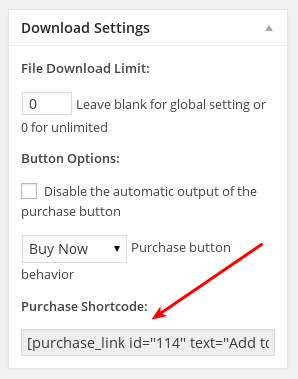 You may also manually place a Buy Now button with a shortcode. Edit the product you wish to make a button for and find the meta box labelled Download Settings. In the bottom of that box you'll find a shortcode. You'll need to get the text from "Add to Cart" to Buy Now (or anything else you'd like) and also add direct="true" to the shortcode. Stripe brings up a modal window where the customer enters their financial information. Once submitted the modal goes away and the customer is immediately presented with a receipt page with the download offered. The modal will ask the user for their email address and pass it to the Payment Record which gets generated under Dashboard → Downloads → Payment History. PayPal, 2Checkout, and Coinbase immediately direct the customer to their payment pages. Once submitted the customer is immediately presented with a receipt page with the download offered. The IPN passed back from the payment gateway will pass the customer's email address to the Payment Record which gets generated under Dashboard → Downloads → Payment History. Guest Checkout: Using "Buy Now" buttons will allow users to purchase without being logged in even if you have the "Require Login" option checked in the EDD Checkout Settings under Dashboard → Downloads → Settings → Checkout Settings. 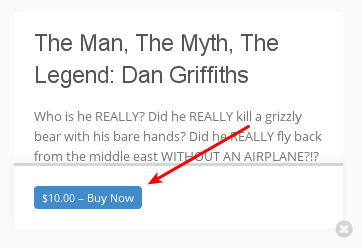 Recurring Payments: at this time Buy Now buttons are not supported by the Recurring Payments plugin.